Maria Butina Guilty In Foreign Agent Case, Admits Clandestine Influence Scheme The Russian gun rights activist had sought to establish back-channel ties between the Russian government and leading U.S. conservative groups, including the Trump campaign and the NRA. Russian gun rights activist Maria Butina pleaded guilty to serving as an unregistered foreign agent. She had sought to build back-channel links to the Russian government with the Trump campaign. 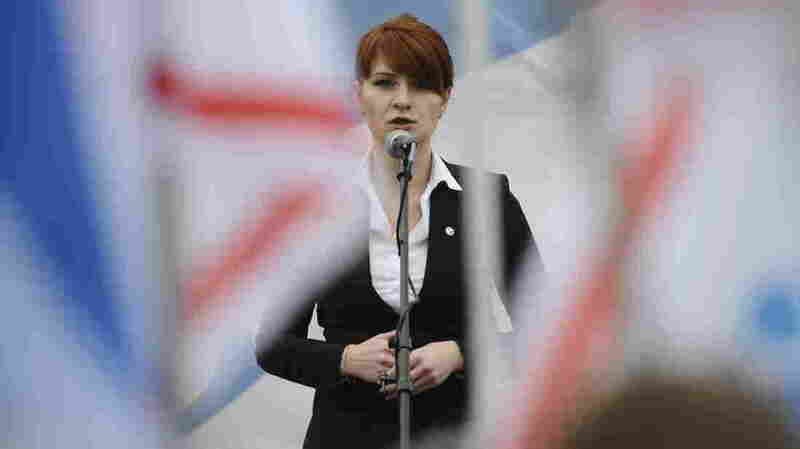 Maria Butina also sought to connect Moscow unofficially with other parts of the conservative establishment, including the National Rifle Association and the National Prayer Breakfast. She was arrested over the summer after having been monitored by the FBI, including in meetings in Washington, D.C., with Russian officials. Butina also had materials that suggested she was in contact with Russia's domestic intelligence service, the FSB, prosecutors said. Butina appeared in court Thursday wearing a green jail uniform, her red hair in a long braid running down her back. She answered the judge's questions in a clear voice and without a Russian language interpreter. District Judge Tanya Chutkan scheduled a status conference for Feb. 12 to assess the cooperation that Butina has given the government. Butina worked in concert with her boyfriend, GOP fundraiser Paul Erickson, and a Russian handler, Alexander Torshin, who also cultivated his own relationships with important conservatives in the United States. A lawyer for Erickson issued a statement after the hearing on Thursday. "Paul Erickson is a good American," it said. "He has done nothing to harm our country and never would." Torshin was a Russian government official who is reportedly retiring from his latest role as a deputy governor of the central bank. Butina laid out her plans in a document called "Description of the Diplomacy Project," according to court documents; she wrote that she believed Russia could not reinvigorate ties with the United States through official institutions. Instead, she argued, Moscow should expand its "unofficial channels of communication," of which she could be one. The course she chose was via gun rights, building off Butina's history of shooting and gun ownership inside of Russia. So Butina, Erickson and Torshin sought to strengthen their relationships with the politically powerful NRA. Butina and Torshin moved in gun rights circles in the United States and, according to court documents, she and other Russians also arranged to host NRA members in Moscow in late 2015. "During the trip, the gun rights organization members met with high-level Russian government officials as arranged by" Torshin, according to court documents in the Butina case. After the visit, Butina wrote to Torshin that "we should let them express their gratitude now, we will put pressure on them quietly later," prosecutors wrote in the court papers. It isn't clear whether "pressure" actually might have been applied to the NRA, by whom or to what end, but its role in Russia's "active measures" has been the focus of scrutiny by members of Congress. Maria Butina has pleaded guilty to being part of a conspiracy to infiltrate and manipulate American democracy. Butina admitted today she was a Russian agent who used the NRA. Americans need to know: Who at the NRA knew Butina’s agenda, and what did they get in return? Butina's work with her compatriots, meanwhile, continued. Erickson, for example, sent an email to the office of then-Sen. Jeff Sessions, working as a Trump campaign booster, offering to use his NRA connections to establish a back channel between the Trumps and the Russian government. "I'm now writing to you and Sen. Sessions in your roles as Trump foreign policy experts / advisors. [...] Happenstance and the (sometimes) international reach of the NRA placed me in a position a couple of years ago to slowly begin cultivating a back-channel to President Putin's Kremlin. Russia is quietly but actively seeking a dialogue with the U.S. that isn't forthcoming under the current administration. And for reasons that we can discuss in person or on the phone, the Kremlin believes that the only possibility of a true re-set in this relationship would be with a new Republican White House." House intelligence committee Democrats quoted that message in their response to the GOP majority's report that said the contacts between people in the Trump camp and Russians in 2016 were "ill-advised" but not evidence of conspiracy. President Trump himself told Reuters on Tuesday that contacts between his aides and Russians in 2016 were "peanut stuff." Those contacts also, so far as the public evidence shows, did not yield a high-level meeting. Although Torshin later met Donald Trump Jr. at an event during an NRA convention, Butina and her colleagues were not able to broker a conference between then-candidate Trump and Russian President Vladimir Putin. The work ran through Election Day 2016 and into the following year, when Torshin instructed Butina about which Russian attendees to arrange to become part of a delegation to the National Prayer Breakfast on Feb. 2, 2017. "Reaction to the delegation's presence in America will be relayed DIRECTLY [emphasis in original] to the Russian President and Foreign Minister." Butina is likely to face only up to six months in prison when she is sentenced in 2019. But prosecutors Erik Kenerson and Thomas Saunders left open the possibility they would write a letter seeking leniency for Butina depending on the extent of her cooperation. Butina told the judge that she understands she is likely to be deported back to Russia after serving any prison sentence. An earlier version of this story incorrectly said the 2017 National Prayer Breakfast was on Feb. 8. It was held on Feb. 2 that year.